A hilltop meadow surrounding a 19th-century farmstead is the site of this multipurpose space, which is lifted into the tree canopy on four tubular steel piles. The habitable volume is constructed of steel whose interior and exterior are clad in weather-resistant polycarbonate and reclaimed white cedar, respectively. It is accessible by a rope climbing net made by hand and lashed on site. Upon gaining entrance to Garrison Treehouse, occupants discover a range of functions that defies the project’s 350-square-foot size. At one end of the main floor, a small balcony protrudes through the envelope and toward the farmhouse. At the other, the facade opens to frame views of the Hudson River Valley; this perch is floored in a second, taut rope net for lounging. Meanwhile, an upper level is accessible by ladder and trap door. 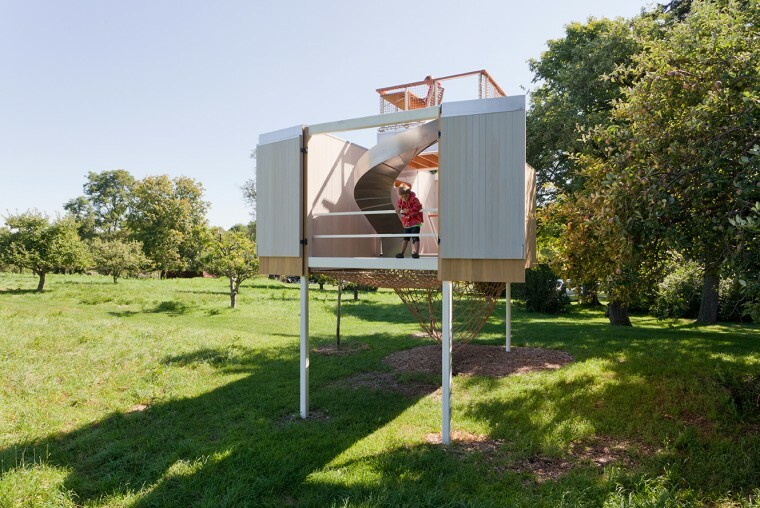 The crow’s nest includes a fold-down mahogany desk, from which sitters enjoy views to the meadow and adjacent apple orchard, as well as a custom stainless-steel slide that arcs between the roof deck and main space. As the treehouse hosts uses ranging from the meditative to the playful, so each activity corresponds to a highly legible building elements. Visitors exit this object lesson in architectonics by sliding down the piles as they would a fireman’s pole.